My name is Tom O’Brien and I’m going to be talking about those who surround, help and support us as associates. That ambiguously could refer to just about everyone in the organisation, however I’m going to focus on the role of my buddy, coach, mentor and sponsor, who have all been essential so far in giving me exposure and experience in all areas of the business. Before I dive into that, let me just thank Maria for kicking off the associate blogs in such a cracking fashion! Couldn’t agree more with her assessment of the first couple of months! It was a whirlwind of action, but what an experience (one I’ll never forget). One thing I’ve learnt so far on the programme is that you are never more than an e-mail or call away from someone willing to give up their time for you, in order to push you forward in the right direction. The supporting network surrounding the associate programme doesn’t just end with the immediate associate team, headed up by Sue Harris (Head of Knowledge & Associate Programmes), who has been brilliant throughout; it extends to various influential people positioned to give you the best support possible. I’ve struck lucky – but that’s the way we all feel! My introduction usually goes something like this, “My names Thomas O’Brien, I’m aligned to Mike Mudd and Allison McLean, with John Charalambous as a buddy…” After, a general echoing of approval follows and it starts to sink in just how fortunate I am to have these people “on my team”. A buddy is as a reference point for someone who’s followed the same path. John Charalambous (Service Management Associate) is someone I can go to with all those questions that crop up along the way, in John’s case, he’s had to put up with an awful lot! 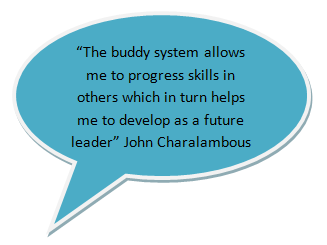 John’s also there to share his experience with me, the kind of things that you can only realise as you progress through the programme. He checks over PowerPoint’s, gives advice and generally points me in the right direction using that wealth of Scottish wisdom. A coach helps to focus on performance in the targeted role and general development of skills. Coach Mike Mudd (Senior Service Manager) ensures I’m on the right path. Supportive is Mike’s middle name, I’m never far away from a great piece of advice or an insight into the life of a service manager. He’s ensured that I’ve gained a rounded understanding of service management, and that I’m exposed to any learning opportunities that come my way. Spending a lengthy time with him and his team on site at the Morrison’s account has advanced my skills but also given me a real picture of the complexity of managing an account. A mentor’s role is help, support and advice provided by an experienced person in order to develop and assist the progression of an associate.I have the great fortune of being aligned to Alison McLean (Service Director), who holds a wealth of experience. Alison is able to place a perspective on what I should be aiming for, she reminds me of the bigger picture and relates back to the journey she’s been on throughout her time at Computacenter. A support team would not be complete without the backing and sponsorship of Julie O’Hara (UK Customer Service Director). This level of buy-in coming from such a senior position within the company enables all of us as (service management) associates to gain exposure to the wider business and strive to be the best we can. Thank you for reading this month’s associate blog edition. Next up we have Lewis Bates who is one of our Sales Associates in the Financial Services and Retail sector. Should be a cracker!